Science lesson here, 3 is a magic number. Ok, maybe not so magic but more logic. In order to assess if a product or technique works for you, try it the scientific way which is 3 different times in the same condition. Why three? One Really you are just being lazy, how do you know that your result is not just a fluke? Two Now you are showing some effort but what if your results were not the same as trial 1? Three This is the magic number, you have tested the product sufficiently enough to get somewhat consistent results (or not, which is also a result!) and an indication of whether or not it works. What does the number 3 have to do with dry hair? The answer is try it three times. However this rule of 3 only works if you do the exact same things each time. For example if you are trying a leave in and you use it immediately after washing your hair, this is totally different to if you choose to apply it 4 days later to 'dirty hair'. Can you relate to that statement? If so, then welcome to the club. It is normal for hair of African origin to feel dry...........take a moment to digest that. Many of us relate moisturised hair to the feeling of hair when it is soaked in conditioner but assume that when it dries and gets a little crunchy then it is misbehaving. Let me remind you of the rule of 3. If you have washed your hair atleast 3 times with a conditioner that you like and still ended up with some crunchy hair...........the dry hair is normal for you (it is for me). An explanation and some science coming up in part 2! Is dry hair normal for you or do you think that all hair should feel soft and moisturised with the right product or technique. CHM - most people do dump after the first time (or worse keep to use but never really do). I think trying it again in the same conditions is always worth it. Also if it doesn't work, try and do something differently (again 3 times) for example if you use a leave in and don't really like it.......if you paid good money for it try and see if it works in combination with a gel. If a conditioner is not really working try and add some oil or some honey to it (in a new container). This helps clear the cupboard out too instead of accumulating stuff that doesn't work. Adding oil/honey to a "failed" conditioner works wonders! Although I think dry hair is definitely normal for me, my hair is at its best when I moisturize and seal religiously!! Ok JC, I typed up a whole bunch and then my computer didn't want to cooperate when I tried to post comment, so here's the abbreviated version. Basically I said, yes and yes. Yes, the hair is naturally dry. Yes, the hair can be moisturized most of the time to its potential with the right product and technique. 1. dry damaged hair - dry, brittle, dull/dusty looking, breaks easily, doesn't absorb water or product easily/quickly and lacks a curl pattern (if you have one that is). 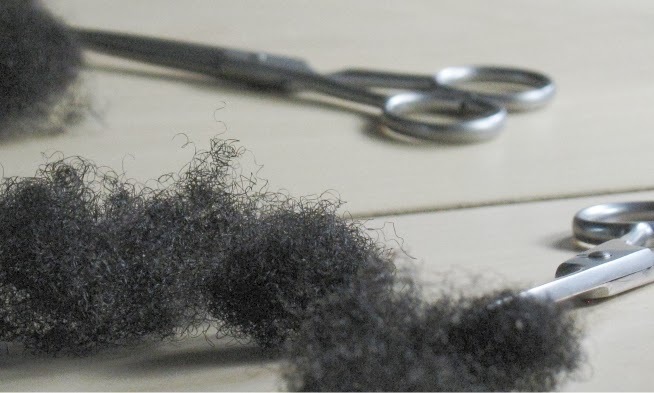 2. dry healthy hair - does not break with normal manipulation, absorbs water/product fairly easily/quickly, there is a noticeable curl pattern, and while there may not be a natural shine the hair is not dusty or dull. I thought this was a great question because I have read many stories about women talking about their issues with dry hair. As I have learned more and payed more attention to my regimen, I have noticed my hair's dryness improve. And there are different degrees of dryness. There is a normal dryness I may expect a week after washing or in the winter, then I would say the day after washing or in humid months. In the end, its probably both! I don't know is this will help everyone but what helped me when i felt that nothing was helping my hair's dryness/crunchyness. I used a strong clarifier treatment..that will remove all the buildup from your hair. At first it makes my hair feel stripped/dry but after I deep condition and follow-up with a good leave-in moisturizer my hair feels alot better. I think the part about people relating moisturised hair to what it feels like with conditioner in it as well is very true. For some people, having the 'soft and shiny!' hair that they so desperately crave could actually be over-conditioning, rather than the correct balance. There's nothing natural about the effect of modern alkaline shampoo on afro textured hair. It strips the hair of what little sebum it has accumulated against the odds due to it's curly texture and thus leaves our hair much dryer than it should be. Anyone who thinks they have dry hair should try not washing their hair at all for a few months (or maybe only wash with water) to actually discover what their hair should naturally feel like. Conditioners are only trying to replace what shampoos have stripped from your hair. Anon actually most modern shampoos are slightly acidic or neutral. The surfactants used measure out at around ph 5.5 and when water is added the final mix is usually circa 6 to 6.5. Shampoo is designed to remove oil, this is its function. If someone does not wish to remove oil from their hair then the remedy would be not to use shampoo. Conditioners by an large actually do not replace what shampoos have stripped off. They contain softeners and surfactants to correct the charge that shampoo leaves on hair and to also give the consumer a feeling of softness. Actually many people with natural hair may have already experienced 'not washing' hair for a few months. For those with the curliest texture this is probably not an effective strategy. The curlier the texture the less the sebum travels down the hair shaft. Many people also report that co-washing does not work on its own and they require the occassional shampoo every so often to ensure that they do not get build up. Stick around anon and have a look at the archives, there is plenty of information there. I think another comparison that people often make is that they think their hair is moisturized when it's really just oily. I find my hair is a lot less dry when I deep condition and wash it on a regular basis (not too often -- probably about once/week). I thought my hair was incapable of shine and softness (softness w/o so much oil). Both were achieved once I started using a decent leave-in (not to be confused with expensive) and deep conditioning a few times a month. As a reference, my hair is pen-spring size and smaller. Mysskay, I like your comment. I agree on the dry healthy as opposed to dry breaking hair. Jaded my hair too is only 'moisturised' by a glycerin water mix but that comes with associated serious curling which is not compatible with styling (I prefer a little stretch so that the hair does not tangle). I will have loads more on the next post. Good post Jc - I know I recently had the same thought thinking...dry hair on my hair MUST be healthy! Can't wait for part 2! Great article! I think mskay is on the right track with her two categories of dryness. I fall into the second category. With that said, I don't think my hair is dry. The second category is *my* definition if moisturized.